« Box #3: Root Rendezvous! Mark your calendars: we’ll be celebrating the 24th birthday of Animal Place with a Pig-Out Birthday BBQ Bash on July 6th. Till then, you have another CSA box to enjoy and inspire some creativity! This week’s box features a new selection that you might not be familiar with: kohlrabi. The leaves are edible, but the real treat is the swollen stem. It has a texture and taste similar to a broccoli stem, but milder and sweeter. Kohlrabi can be eaten raw, pickled or cooked. Kohlrabi plant. The bulb-like stem and leaves are edible, and delicious! 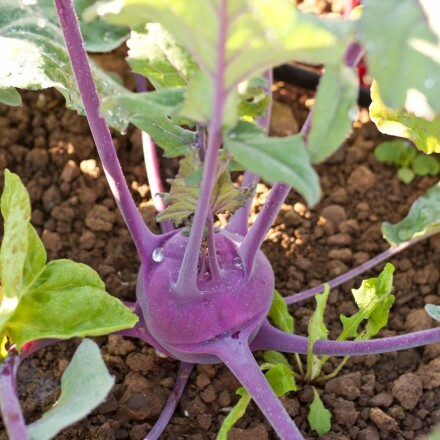 Kohlrabi – a member of the brassica family, related to cabbage, broccoli, kale, collards and more. Golden Globe Turnip – this variety tastes more like a rutabaga, and is really great mashed. Use your favorite mashed potatoes recipe, substituting this beauties for the taters. Collard Greens – finally, we can offer you this tasty summer green. It’s sturdy, and can be used as a wrap. Cut out any thick stems. Dino Kale – gets its name from the bumpy leaf surface resembling dinosaur skin! Also known as lacinato kale. 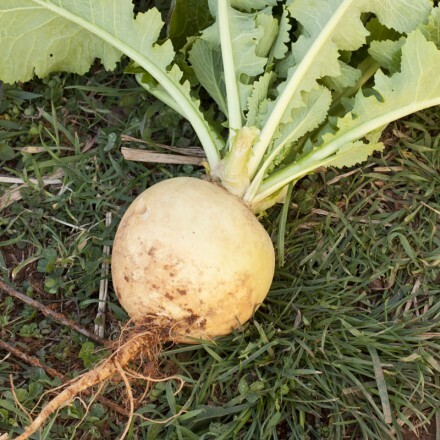 Golden Globe Turnip – great for mashing! Sugar Snap Peas – A light, crunchy snack or salad topper. Rainbow Chard – red, yellow, pink and white leaves add color to any dish, cooked or raw. Watermelon Radishes – spicy, and beautifully magenta inside. Raw, sautéed or roasted. That’s it for awhile! Carrots – can’t beat em! Beets – juice them, grate them, slice them, roast them, boil them, pickle them. If you’ve visited our farm or follow the Animal Place blog, you may have met our amazing two interns, Andy and Rebecca. 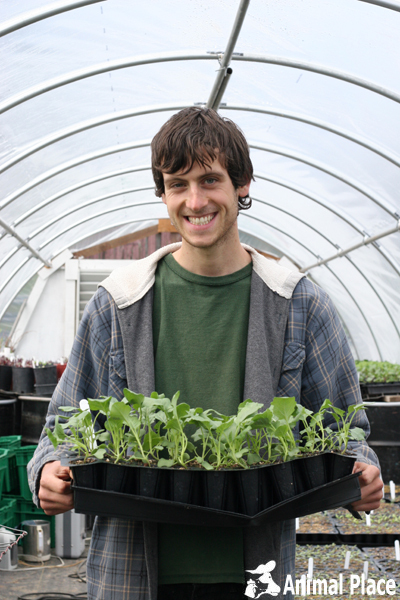 Your CSA would not be possible without them! They have gone from farm-curious to farm-saavy in just a few months. Later this season, you can personally thank Andy for the pumpkins and watermelons – it was his idea and motivation to further expand our fields and plant these two crops. Thanks, Andy! by the Messy Vegetarian Cook . Check out the link for more tips on this recipe. 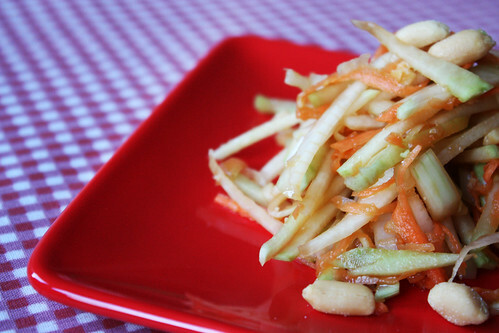 Cut the kohlrabi into matchstick sized pieces or shred with a grater, whichever works best for you. I used a mandoline to julienne. Do the same with the carrot and combine in a large bowl before adding the chopped onion. Use a pestle and mortar to combine the sesame oil with the garlic and ginger. When you’ve achieved a nice even paste, add the sugar and other liquid ingredients. This method is optional (you can simply crush, mince, and mix), but worthwhile in my opinion as it really mixes the flavours well. Add the liquid with the vegetables and stir until covered. Add salt and pepper to taste.